All western red cedar inside and out cozy 750 sq. 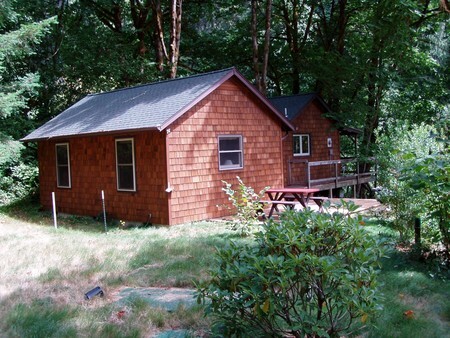 ft. 2 br, 1 bath cabin on the Alsea River. 2.5 acres, 100' river front. Private lane. Personal drift boat slide. Great fishing for winter steelhead and native cutthroat trout! Fun in the summer for family and friends. Inner tubes and crayfish. Chantrelle mushroom picking in adjacent Siskyou Natl. Forest land. Located mid way between the coast and the Willamette Valley. Well, septic.